I'm really excited to be the next stop on the Block Party blog tour for a couple reasons. 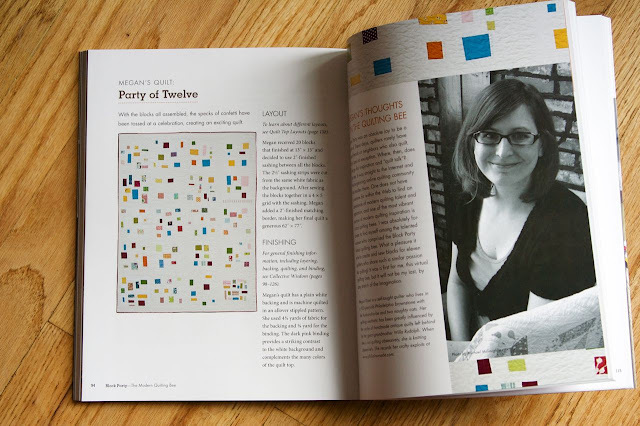 First, because I think the book is a good one, and second, because I was lucky enough to be involved with each quilt in the book--and I think they are all great. 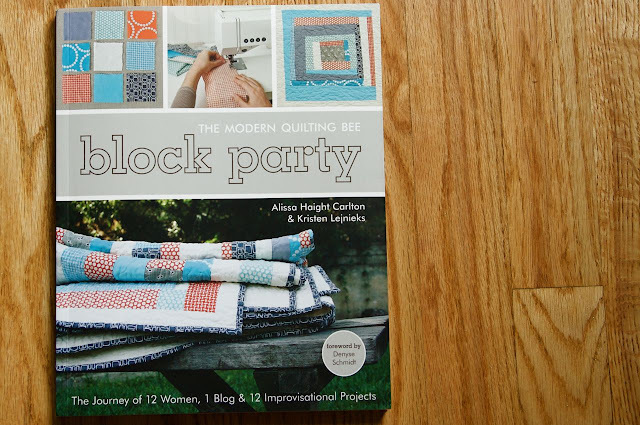 Block Party--The Modern Quilting Bee was written by Alissa Haight Carlton and Kristen Lejnieks, but the quilts were a collaboration of 12 quilters--the book followed our virtual quilting bee. I love actually seeing bee quilts finished...don't you? 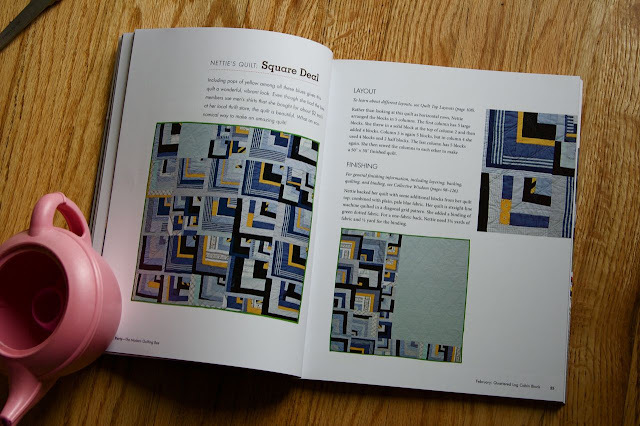 My favorite thing about this book is there isn't really a pattern for each quilt, there are guidelines and suggestions, which leaves lots of room for your own creativity! The folks at Stash Books are offering a copy of the book to one of my readers. To enter, leave a comment, one per person (make sure I can reach you via email). I will choose a winner on Thursday (june 23) morning. Good luck. such a great book. if i don't win one i am going to buy it... be assured! I would love to have a copy, thanks for sharing. Awesome book, would love to win a copy :) Thank you for the review! Such an exciting tour. Can't wait to see this book. Buying it if not winning. Great book, great giveaway. Can not wait to flip thru to see all the wonderful designs. Yep, I, too, will get a copy of this, whether by winning or buying. It looks like such a neat recap of a quilting bee. Plus, there are some fun quilting ideas as well! This is really great. I'm just finishing my first big quilt every and feel so proud, what pride there must be in a whole book of collaborative quilts! How fun that your kids are in it!!! Love this book! Can't wait to see it in person. Love it! I really want this book. Cute pics of your kids too! And the book looks great, of course! I'd love to win this book. Love your quilt. Thanks for the giveaway! What a great book, I'm looking forward to seeing it. Been loving all the peeks at this book around blogland...thanks for the giveaway! I can't wait to get a copy of this book! what a great book. i've always wanted to know more about a quilting bee and see how the quilt all comes together. thanks for sharing. i have my eyes on this new book...have to have it as a prize or buying it, whatever. tks fr the chance! Would love q copy of the new book. Thanks for the review. Yay! Famous kids, every parent's dream!! Great book. I would love to give it to my niece. I am so excited about this book! It looks great! It looks like a great book. thanks for the chance to win it! I would love to win a copy of this book. I am definitely a “suggestions and guidelines” kind of quilter. Thanks for hosting the giveaway! Wow - great giveaway. I would LOVE this book. The quilts are so modern and fresh...thanks for the chance! This book looks like it is full of inspiring projects, I can't wait to check it out. That book looks wonderful. Thanks for sharing. Looks like a great book, count me in! I'm gushing over this book! The book looks great, thanks for the giveaway. I have been seeing this book everywhere and would love to win a copy! Awesome party, congrats on being a part of something great! Thanks for doing this giveaway! This book looks great! Thanks to you and Stash Books for hosting this giveaway. What a beautiful picture of your kids (and a lovely book). Thank you for the give-away. Saw the book in person at Barnes and Noble. It's gorgeous! wow! those are amazing quilts. thanks for the opportunity! the more i see of this book, the more I love it! Wow - How neat that you helped in making every quilt. You should be proud! The book looks amazing! Thanks for the chance to win! I watched the short video on the book & now I have to have it. Thanks for the giveaway. The more I see pieces of this book the more I realize I need to have it! Beautiful work, ladies. I love a book that encourages creativity! This one looks great. Thanks for the chance to win. Oh boy! I love the projects in this book! I'm keeping my fingers crossed!! I love the party of 12 block, too! I made a confetti-style block for a bee a few months back. It was a lot of work, but totally worth it after I saw the finished quilt top! Loving this block party! What a great looking book. Thank you for being so generous!! :) Would love to have a copy, I've learned having books is a beauitful way to stay inspired and a great reference tool. Thank you for the review of the book. It looks wonderful! Thanks again! Looks like a fun book - would love to check it out. Thanks for the chance to win! Looks like an awesome book. Thanks for the chance to win. Glad to have found your blog! I'd love to win. I'd love a copy of this book! Thanks for hosting the giveaway. What great quilts! And cute kids! I pre-ordered the book on amazon and I love it! I'm hoping to win so I can give a copy to a quilty friend! Congrats on the book finally being out! It's already very high up on my wish list :) I've just finished my first bee (so.much.fun!) and would love to read this book and make a few of the quilts. Thanks for the chance to win! The book looks like a lot of fun too....I would love to win a copy! Looks awesome. Thanks for the chance! This book looks like so much fun. Thanks for the chance to win. This book looks like a must-have! Thank you for the generous giveaway! I'm loving those quilts you pointed out and would love to see what else I could make from the book! What a fun idea. Hope I win a copy of this cute book. Love that 'Party of 12' quilt! wow, that looks like an awesome book full of amazing quilts! ooh ooh pick me! pick me! I am dyin to get my hands on this awesome new book! LOL congrats on your kids (and you) being famous! LOL!! I am loving all the glimpses of this book - it's going to be a "to-buy" item on my list! I would love a copy of this book. The quilts are so cool! I really want to start a collaborative sewing project. This book would be just the thing to get me started! I'm very excited about this book! It looks wonderful! Fantastic picture of your kids...and now they are famous (at least in the quilting world!)! Thanks for a chance to win! The book looks amazing! It would be nice to win a copy! What a great book! I love that you said it has guidelines and not exact patterns. Your kids are adorable! Your kids are adorable, they deserve to be famous. Thanks. What a really nice book. I'd love to win a copy! I love this kind of book. It will not constrict oneself but to further develop our own 'designing' skills. This book looks like great fun! I am starting a sewing class with some ladies at church and we talked about doing a quilt at some point. This book looks like it is full of ideas to get us started. What a great way to meet friends of quilt blog friends. Expanding community one quilt at a time! That is so cool that your kids made it in the book with your quilt! I've been wishing for this book--oh, I'd love to win it. *Great photo of your kids, btw. So cute! Looks like a great book with lovely quilts! Thanks for the chance to win! Love all the projects in the book! I would love to win a copy of this book, thanks for the chance. I'd love to win a copy of this book! Thanks for a chance at the book - looks like some great collaborative quilts in there! Count me in, and thanks for the opportunity! I am *so* excited about this book. Huzzah! I would love to have this book, pick me!!! I so enjoy the book blog tours... good insight from different reviewers! Guidelines vs. patterns = good for me. I love the inspiration. Thanks for the opportunity to win a copy. 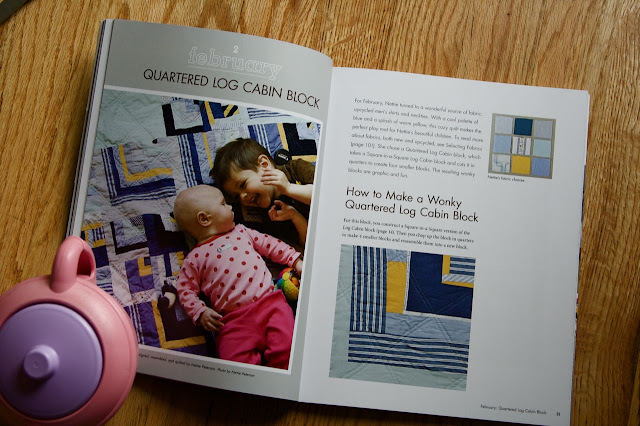 How cute that your adorable kids made the book (and your awesome quilt, too of course). Thanks for hosting! From what you shared, this book looks awesome!! Thanks! the more I see of this book, the more awesome it looks. congrats! and thanks for hosting the giveaway. Thanks so much for the giveaway. I can't get over how fabulous this book looks! Thank you for the chance to win this book ! The book looks fun! Thanks for the chance to win. This book sounds fascinating- I'm partway through my first bee, and it's been so fun! I want this book!!! Thank you. So excited for you *all*!!! I can't wait to see it in person! I've been trying to figure out how to get more of the modern freedom and freshness into my projects and was planning on buying this book to gain some insight. But if I win one even better! Oh I keep seeing this and each time I want it more! Fingers crossed, and thank you! I like the color palette of that quartered log cabin. Cute kids too! Thanks for the giveaway and the previews. I'd love to get my hands on a copy! How awesome that your kids are in the book! This book looks absolutely fabulous...I love that it is about technique and creativity rather than itemized steps to follow. Ahh I like these blog tours, and not just for the chance to win prizes. I am introduced to new to me blogs and bloggers. Thank you. Quilting books are always so wonderful to have!! This looks like it would be full of inspiration! Looks fantastic - and I follow you all anyway so a book with all of you in it has to be amazing! This looks like such a great book... I would love to win! I'd love to be entered in the drawing. Thanks! Sorry, I tried to leave my email address in the last comment and it didn't work. I'm so excited I caught the very beginning of this blog tour! Thanks for the giveaway! I would love to win the book ... fingers crossed! Congrats on being in the book and so cute to have your kids featured too! Congrats on the book and thanks for the opportunity. What a sweet picture of your kids! They will always be able to tell their friends they are in a book :). Congrats on your contribution - the whole book looks great! Looks like a great book to own so I'm hoping to win or I'll have to buy one. Looks like a great book. I like the idea that it is suggestions and not specific patterns. I sometimes need to be pushed into my own creativity. This book is very cool. I will defintely buy it if I don't win it somewhere along the way on the blog tour. The book looks so cool, I can't wait to get my hands on a copy! At first glance I thought the teapot in your photo was a Nettie pot. Kind of random, I thought, but whatever! This book sounds so awesome. I've been watching bees from afar for a while now but not brave enough to join. This book looks so neat! Thanks for the giveaway! I love the free form wonkiness of the quilts. I will definitely buy this if I don't win! This book looks really great! Such a nice book to keep my nose stuck in it! I would love to win! Congratulations!! Love your quilt and your kids are adorable, it's such a great picture! The book looks amazing too! Thanks so much for the chance. this book is on my wishlist. Thanks for the giveaway. Congrats on the book! I'd love to win one! I'd love to win a copy! So far, all of the pictures I've seen are ideas that I would love to try myself. Great book -- thanks for the giveaway!! Totally awesome! I would love to win copy of this book! this book is amazing. thanks for the giveaway!! As much as I love improvisational quilting, sometimes I need a push or a direction. This book looks great for that. What a great book! I'd love to win it! Love this giveaway! Thanks for hosting!!! Looks like such an awesome book, I hope I win! This book looks amazing! I'd love the chance to win a copy! I would absolutely love to receive a copy of this book....thanks for a great giveaway!!! FUN FUN FUN. love this book! I am really enjoying seeing what is in this book! I would love to win a copy! 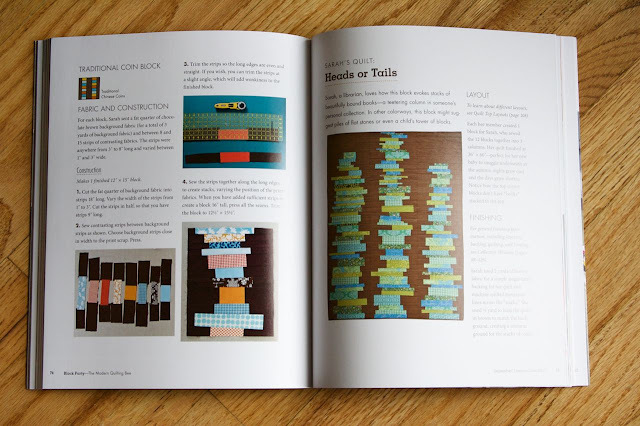 As much as i would love a copy of the book, it's fab to find the person who did the summer blocks quilt in Sew Hip. It's the second of all their quilts that i want to do and only second because the first had applique and i had never tried that before. So thank you for that! I loved the book so much I bought a copy and ahve started to make the circle quilt pattern. Love the patterns I've seen in this book, would love to make a few of them. Looks like a super book. Thanks for the chance! Cute Kids!! I hope I win the book. so cool! congrats on the book! I'm really hoping I win a copy of the book. But if I don't, I have no doubt I'll end up buying it. Such great quilty inspiration! I would love to win a copy of this book...love the sneaks you gave! This book looks so interesting. So many different ideas. ps......Love seeing your famous kids! What a fun book! Congrats!! Loving the glimpses of this book so far. This book sounds so interesting, especially for quilters like me who have never been in a quilting bee. Am anxious to see it in person.